Francesca The Method: Ionized Water and Why I Tried It! Ionized Water and Why I Tried It! This zero-calorie drink is the key to a healthy life. So after a lot of thinking and research, I came across ionized water. Scientific research on the benefits of using a water ionizer is still developing. However, my experience with ionized water has been amazing. I chose to drink ionized water because it is chemical-free, eco-friendly (no wasting plastic), more alkaline than regular water, and believed to contain more antioxidants. To begin the process of buying my first water ionizer, I contacted Aviva Water. I was fortunate to speak to Aviva Water owner Richard Hereward and have Matt Strachen to assist me in selecting the perfect product for my needs and lifestyle. I was very pleased with the company’s knowledge, efficiency, and customer service. Shortly after the first call, I received the Jupiter Science Ionizer in the mail. Photo courtesy of Aviva Water. Jupiter Science Ionizers work by using an electrical current to ionize drinking water. The Jupiter Science Ionizer’s electrical current and specialized filter removes most harmful contaminants, such as chemicals, hormones, heavy metals, and pesticides, leaving only healthy minerals, such as calcium, magnesium, and potassium. 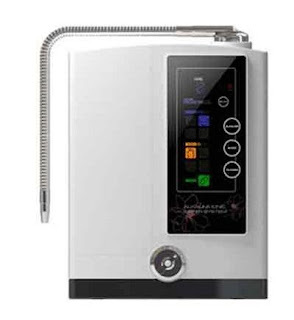 From the Jupiter Science family of water ionizers, I selected the Venus Ionizer. With the Venus Ionizer, I can vary my water’s alkalinization and acidity. I use more alkaline water for drinking and more acidic water for cleaning. The Venus Ionizer allows me to live in a more alkaline environment and to use and drink cleaner water. I think it is a great product for those who are health-conscious. I have chosen the Jupiter Venus Ionizer for my lifestyle. Which one will you choose? *Please note that this blog is not intended to provide or take the place of medical advice or treatment. This blog post is based on personal experience. FG Pilates, as a company, does not endorse the use of water ionizers. FG Pilates recommends that readers review the benefits of alkaline water with their doctor prior to making any lifestyle changes.